HomeWorldIs Japan Signaling the Beginning of the End? Is the Bank of Japan losing control over rates? The theory of QE is that the central bank can manage rates down by purchasing bonds, but the bond vigilantes in Japan are pushing back. In the US the fear is that the Fed will be unable to taper off QE. The Bernank’s remarks last week were of a taper, and yet in the US the 10 year has spiked above 2%. There is a concern that if rates go above 2.2-2.25%, the biond portfolios will begin to rotate their mix of long and short bonds, essentially causing a spike in the ten-year which might shoot it to 2.5% – the so-called Bond Convexity. If this happens, expect the Fed to stop the taper and jump back in with (say) two months of QE in one month, to drive rates down. 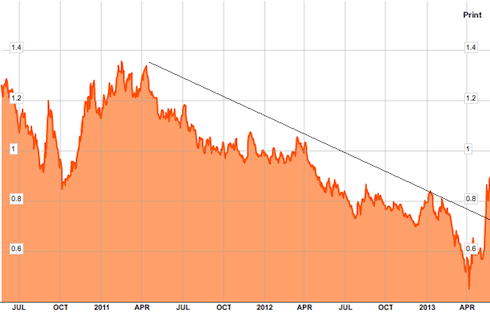 This would be quite a good buying opportunity of the ten year. It also may signal that even the Fed will face issues in trying to taper and avoid losing control over rates.